The first thing I noticed about this book while I was reading is that the title "Since You've Been Gone" was repeated in some parts of the book, yep ocd, it made me curious who was gone. As I continue reading, I find myself enjoying the book despite the slow movement of the story. I was so eager to know everything but then the information was limited at first. Not everything was revealed at the first parts of the book yet it will give you hints on what happened in the past, you'll get clues. So Edie is not living a normal life as much as she wants to, no matter how her mom tried hiding and living in different places, they will be found by Edie's father. Since they decided to leave, her dad kept hunting them down and every thing turned upside down. It was not easy for Edie but there is nothing she can do. She and her mom moved to London, she has to start another life there, new people, new environment and build new friends. Nothing is great for Edie is adjusting with her life but then something awful happened. Her mom didn't come home from her first day at work and Edie decided to search for her mom a kind hearted Jermaine joined her with the search but then, the truth broke Edie's heart in to pieces. Well, this is a heartbreaking kind of story to be honest. I can relate with the story. I mean I know how hard it is to move on to something you're not used to. What happened in the book shattered my heart in to pieces but then I salute Edie for she became strong with every thing that's happened to her. It wasn't easy but she made it. That taught me a lesson. I like how the book was written. I like how it switches from happy to sad to happy and heartbreak to happiness again. It was really awesome. I am more curious now that Edie will have a new life, as in really new. I feel like she is more stronger now that the first time I met her in this book. PS. This is an inspiring story of a girl who stayed strong no matter what challenges she had with her life. Mary Jennifer Payne's writing has been published in journals, anthologies, and magazines both in Canada and abroad, and she is the author of several YA graphic novels. 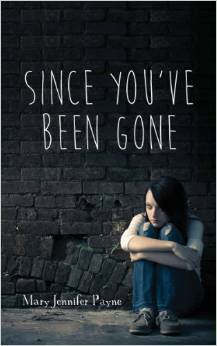 Since You've Been Gone is her first YA novel. She teaches with the Toronto District School Board and lives in Toronto.